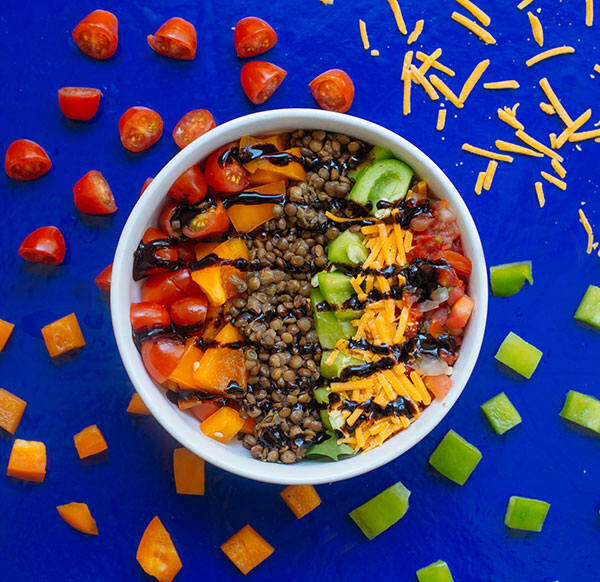 This colorful and flavorful Rainbow Lentil Bowl is filled with a delicious combination of cherry tomatoes, sweet peppers, green lentils, mixed greens, and red cabbage. Top it with cheddar cheese and a pico de gallo salsa for a Southwestern twist. You can find pre-cooked lentils in the produce section of many supermarkets, or buy them canned, but it’s much cheaper to cook your own lentils and it takes less than 30 minutes. Here’s how. This recipe yields four hearty servings and keeps well in the fridge, so it’s a great recipe for a family dinner, for your next potluck, or to try in your next meal prep. Evenly layer half of pico de gallo, cheese, cabbage, lentils, orange bell pepper, green bell pepper, tomatoes, and remaining half of pico de gallo on top of salad greens in “stripes." Add a bit more protein for a great dinner option for the vegan plan. For non-vegans, add a protein for lunch.